Pittsburgh Ballet Theatre (PBT) Artistic Director Terrence S. Orr has signed four new dancers to the company roster for PBT's 50th Anniversary Season in 2019-2020, which opens Oct. 25-27, with "Giselle" with the PBT Orchestra. PBT School graduate students Allison Durand, of Charleston, South Carolina, and Jack Hawn, of Detroit, Michigan, will both join the company as apprentices for the 2019-2020 Season. Two students of Pacific Northwest Ballet School, Grace Rookstool, of Whidbey Island, Washington and Sam DerGregorian, of Albuquerque, New Mexico, will also join PBT as apprentices. Durand and Hawn will make their final performances as students in the school's two year-end performances: Pre-Professional Showcases, May 17-20, at Point Park University, and Spring Performance 2019, May 24-25, at the Byham Theater. In other roster changes for the 2019-2020 Season, dancers Marisa Grywalski, of Columbus, Ohio, and Corey Bourbonniere of Woonsocket, Rhode Island, were promoted to soloists. Single ticket sales for "Giselle" and other 50th Anniversary Season productions open Aug. 6, at www.pbt.org, 412-456-6666 or the Box Office at Theater Square. Tickets start at $28. Subscription packages, starting at $81, are available now by visiting www.pbt.org or calling 412-454-9107. Sam DerGregorian is from Albuquerque, New Mexico. He started dancing at age 9 with La Mesa Dance Academy, and at age 16 he was a member of the New Mexico Ballet Company. While at NMBC, he performed in productions including "The Nutcracker" and "The Wizard of Oz." He attended summer courses at Walnut Hill School for the Arts, Ballet Chicago, Miami City Ballet School and Pacific Northwest Ballet School. PNBS He was invited to join the PNBS Professional Division, where he trained for two years. While at PNB he performed with the company, including productions of George Balanchine's "The Nutcracker" and "A Midsummer Night's Dream," and "The Sleeping Beauty." With the school, he performed in productions including original works, Jerome Robbins' "Fanfare," "Pinocchio" and "Snow White." Allison Durand, originally from Charleston, South Carolina, has trained in PBT's Graduate Program and Intensive Summer Programs since 2016. 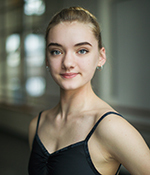 Before moving to Pittsburgh, she studied with Michael and Olga Wise of Robert Ivey Ballet Academy; Charleston County School of the Arts; Amanda Neikirk; and Carroll Thompson. She also attended the American Ballet Theatre Summer Intensive. She has performed in "Giselle," "Alice in Wonderland," "Romeo and Juliet," George Balanchine's "Rubies," "The Great Gatsby" and "The Nutcracker" with PBT, and has choreographed numerous works on fellow students during her time in the grad program. Jack Hawn received his early training near his hometown of Detroit, Michigan before joining the Pittsburgh Ballet Theatre School in 2012. Since then, he has performed in PBT productions such as "The Sleeping Beauty," "Le Corsaire," "Romeo and Juliet," "The Nutcracker," "Alice in Wonderland" and "The Great Gatsby." Additionally, Jack has composed original music for two PBT School ballets: "Dovetail" and "Gust." Grace Rookstool was born and raised on Whidbey Island, Washington. Her love of ballet began watching her older sisters dance at local studios on the island. She joined them at age 3, and began her classical ballet training at Pacific Northwest Ballet School in Seattle when she was 8 years old. She spent the next eight years in the Student Division and another two years completing the Professional Division Program. She has had the opportunity to dance with the company in many productions, including "The Nutcracker," "Swan Lake," "Sleeping Beauty" and "Midsummer Night's Dream." During her time in the PD Division, she was selected for an exchange program with Dresden Semperoper Ballett where she performed as a guest apprentice in "La Bayadère."